Rockstar Energy Suzuki Europe faced a wet and difficult Grand Prix of Latvia at the Kegums circuit and while they could take satisfaction from Brian Hsu winning the second moto of the EMX250 European Championship and claiming his third podium finish in a row with second overall, MX2 rider Jeremy Seewer also rode well and just missed the rostrum with fourth place on the RM-Z250. It rained and poured through the morning at Kegums, around 70km outside of the capital city of Riga; and 23,000 fans braved the erratic weather and changing skies. A stiff breeze helped dry the terrain throughout the afternoon and the surface was bumpy and challenging with varying levels of grip. Seewer rode to a strong fourth position in the opening moto. He completed 15 of the 17 laps in the same place following Davy Pootjes. In the second outing another vibrant start again saw him in the top-four and he was only bumped to fifth by Tim Gajser; winner of the three previous Grands Prix. At one stage he was in contention for a second successive rostrum appearance and fourth of the season but could not demote Harri Kullas; the difference was just two points when the last berms had been hit. He sits fifth in the MX2 standings and only four points from the top four. Hsu celebrated his third podium finish of the season in the seventh round of nine in the EMX250 European Championship and also toasted his first chequered flag in the category in what is his maiden term on the RM-Z250. The German teenager didn't get the best of starts and finished eighth in a dry first moto on Saturday while fighting a poor choice of suspension setting. But the sandy nature of the terrain suited team-mate Bas Vaessen and he rode to a career-best fifth place. Vaessen’s all-action style was one of the highlights of the second moto on Sunday morning but his attacking philosophy carried a price with a small crash while pushing Hsu for third position. The Dutchman then became engaged in a brief scrap with Maxime Desprey for fifth place until the Frenchman suffered a spectacular crash. Vaessen concentrated on his lap-times and reeling-in Hsu to take part in a frantic four-rider tussle for the win in the final two minutes of the moto. Hsu was superb to force his way to the front and claim a maiden EMX250 victory and Vaessen desperately unlucky to fall again heavily on the last lap while charging for third spot. The youngster was able to pick himself up and take 15th for seventh overall. Hsu is now fifth in the championship while Vaessen is 18th. The penultimate fixture of the series will take place in the sand of Lommel for the Grand Prix of Belgium at the beginning of August. For Seewer and the rest of Rockstar Energy Suzuki Europe the Grand Prix of Czech Republic at Loket will represent their next MXGP date, a week after the fifth round of the ADAC MX Masters Championship coming up in a few days at the sandy Tensfeld circuit. MX2 Moto1: 1. Max Anstie (GBR, Kawasaki), 35:51.424; 2. Pauls Jonass (LAT, KTM), +0:07.869; 3. Davy Pootjes (NED, KTM), +0:13.274; 4. Jeremy Seewer (SUI, Rockstar Energy Suzuki) +0:14.611; 5. Harri Kullas (FIN, Husqvarna), +0:23.594; 6. Jordi Tixier (FRA, Kawasaki), +0:29.166; 7. Tim Gajser (SLO, Honda), +0:55.725; 8. Ben Watson (GBR, KTM), +0:57.750; 9. Roberts Justs (LAT, KTM), +0:58.728; 10. Brian Bogers (NED, KTM), +0:59.584. MX2 Moto2: 1. Max Anstie (GBR, Kawasaki), 34:44.364; 2. Pauls Jonass (LAT, KTM), +0:13.123; 3. Harri Kullas (FIN, Husqvarna), +0:21.819; 4. Tim Gajser (SLO, Honda), +0:24.819; 5. Jeremy Seewer (SUI, Rockstar Energy Suzuki), +0:28.107; 6. Brian Bogers (NED, KTM), +0:30.405; 7. Jens Getteman (BEL, Honda), +0:33.825; 8. Jordi Tixier (FRA, Kawasaki), +0:36.567; 9. Thomas Covington (USA, Kawasaki), +0:44.559; 10. Julien Lieber (BEL, Yamaha), +0:47.071. MX2 Overall result: 1. Max Anstie (GBR, KAW), 50 points; 2. Pauls Jonass (LAT, KTM), 44 p.; 3. Harri Kullas (FIN, HUS), 36 p.; 4. Jeremy Seewer (SUI, Rockstar Energy Suzuki), 34 p.; 5. Tim Gajser (SLO, HON), 32 p.; 6. Davy Pootjes (NED, KTM), 30 p.; 7. Jordi Tixier (FRA, KAW), 28 p.; 8. Brian Bogers (NED, KTM), 26 p.; 9. Ben Watson (GBR, KTM), 20 p.; 10. Thomas Covington (USA, KAW), 19 p.
MX2 FIM World Championship Standings (after 12 of 18 rounds): 1. Jeffrey Herlings (NED, KTM), 423 points; 2. Tim Gajser (SLO, HON), 377 p.; 3. Valentin Guillod (SUI, YAM), 352 p.; 4. Pauls Jonass (LAT, KTM), 351 p.; 5. Jeremy Seewer (SUI, Rockstar Energy Suzuki), 345 p.; 6. Jordi Tixier (FRA, KAW), 334 p.; 7. Max Anstie (GBR, KAW), 312 p.; 8. Julien Lieber (BEL, YAM), 278 p.; 9. Aleksandr Tonkov (RUS, HUS), 256 p.; 10. Dylan Ferrandis (FRA, KAW), 205 p.
EMX250 European Championship overall result: 1. Damon Graulus (BEL, YAM), 43 points; 2. Brian Hsu (GER, Rockstar Energy Suzuki), 38 p.; 3. Thomas Kjer Olsen (DEN, KTM), 38 p.; 4. Nick Kouwenberg (NED, HON), 36 p.; 5. Lars van Berkel (NED, KAW), 34 p.; 6. Pontus Jönsson (SWE, HUS), 26 p.; 7. 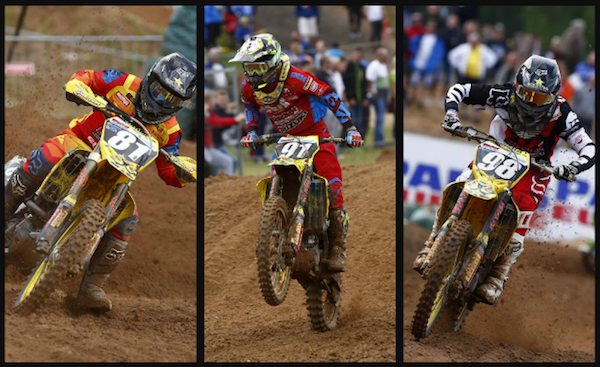 Bas Vaessen (NED, Rockstar Energy Suzuki), 22 p.; 8. Adam Sterry (GBR, KTM), 22 p.; 9. Luca Nijenhuis (NED, KAW), 20 p.; 10. Ken Bengtsson (SWE, KTM), 18 p.
EMX250 European Championship Standings (after 7 of 9 rounds): 1. Nick Kouwenberg (NED, HON), 255 points; 2. Damon Graulus (BEL, YAM), 240 p.; 3. Adam Sterry (GBR, KTM), 222 p.; 4. Maxime Desprey (FRA, KAW), 217 p.; 5. Brian Hsu (GER, Rockstar Energy Suzuki), 169 p.; 6. Ander Valentin (ESP, YAM), 154 p.; 7. Alvin Östlund (SWE, YAM), 146 p.; 8. Thomas Kjer Olsen (DEN, KTM), 132 p.; 9. Steven Clarke (GBR, HUS), 118 p.; 10. Simone Zecchina (ITA, KAW), 112 p. 18. Bas Vaessen (NED, Rockstar Energy Suzuki), 56 p.